Here is a recipe for another popular cabbage dish, small square noodle flakes (fliačky) with cabbage (kapusta). This dish is quite similar to strapačky, but it’s made with pasta instead of the small potato spaetzle dumplings. It is also made with fresh cabbage instead of sauerkraut. Fliačky are often eaten sweet topped with powdered sugar. They were one of several favorite dishes of mine when I was growing up, along with poppy seed noodles and plum dumplings. 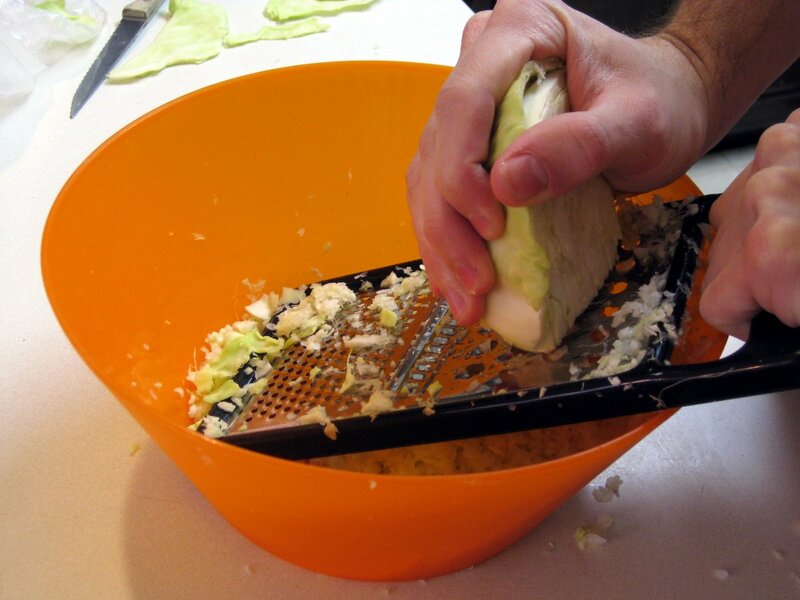 Start by shredding the cabbage using a grater. The squeeze out as much liquid as you can, this will keep oil splatter down. Heat up about quarter cup of oil in a pot and add two tablespoons of sugar. Wait for the sugar to start turning to brown caramel, this will take about 2 minutes. Then carefully add the cabbage. 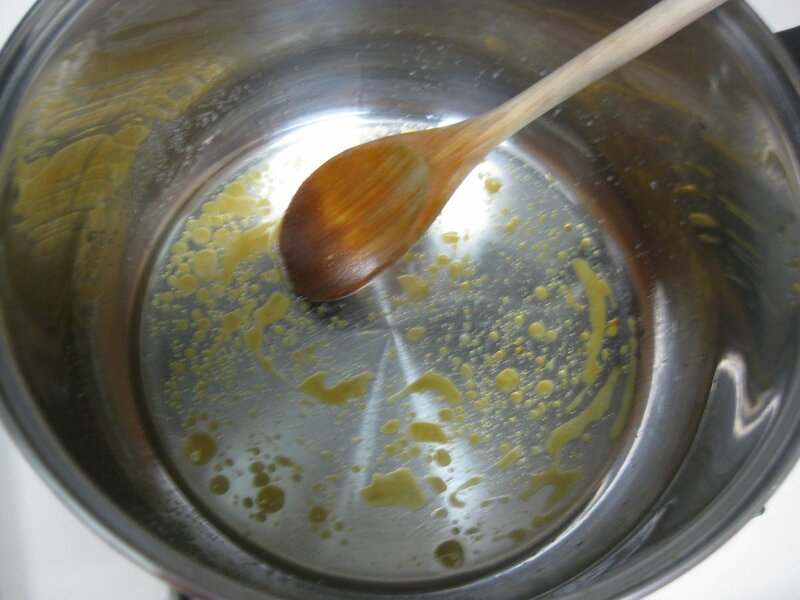 Doing it like this by hand is probably not the smartest, since the oil will splatter. Be careful not to burn yourself! The cabbage will quickly absorb the oil, and the liquid caramel will also turn into rock chunks. 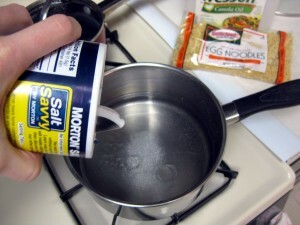 No worry, it will dissolve when you add water. Add just enough water to cover the cabbage, pinch of caraway seeds if you like them (and also black pepper), lower the heat, cover, and let simmer for about an hour, stirring frequently. When the cabbage starts getting tender, start preparing the noodles. 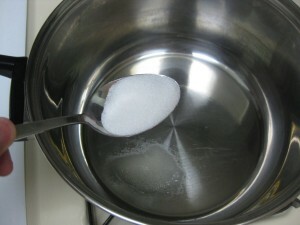 Cook the flakes in a pot of salted water for 10 to 15 minutes. 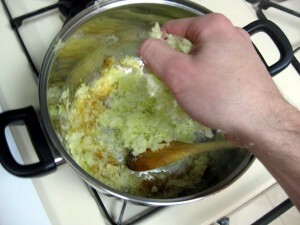 Strain the noodles and mix into the cabbage, which by now should be dry and have all the water evaporated out. 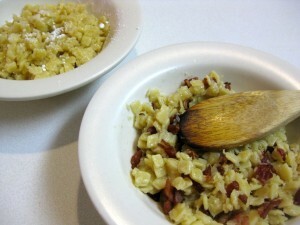 Top the noodles either with bacon bits, or if you like them sweet, with powdered sugar. Enjoy! It is funny I just made them yestarday. I have similiar recipe but i cut the cabbage for bigger pieces and use brown sugar instead of powder and put it little black pepper. Lenka, I actually also used little bit of black pepper. I forgot to mention it in the recipe, thank you for the reminder. Unfortunately, though she taught me to make it, I don’t often because I could eat the entire pot by myself. This is how my mom and grandmother made it, too. (No sugar) when I make it, I try to make it last a few days…because I can eat the whole thing, too! I do this but do not grate my cabbage. I chop it up as if I was going to use it for coleslaw instead. My husband is totally American but really loves this dish!!! We called this “halusky” growing up. We didn’t grate the cabbage, either, just shredded it. Lubos, I make my kapusta or halusky a little bit differently but it is very similar to this. I fry up some bacon and then in the bacon grease, I add a small sliced onion, shredded cabbage, pepper and about a teaspoon of thyme. I stir fry it briefly and then add about 1/2 cup of water. After adding the water, I put a lid on the pan and reduce the heat, cooking it until tender. Sometimes, instead of bacon, I use smoked sausage. In a separate pot, I cook the noodles. (I’ve used egg noodles, bow ties, spaetzle, klutski, etc.) 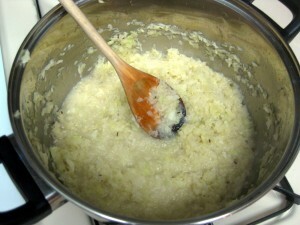 When the noodles are done, they are drained and added to the cabbage & onion. Toss well and serve it up! Your version sounds really good & I’m going to have to try it. I love the site. Thanks! I make my Grandma’s halushki. Never use sugar. Cabbage chopped fine, I guess grated would be ok, but I’ve never done it that way. Fried in butter with onion and garlic until transparent. Add sauerkraut towards the end, and fry that up a bit. I don’t use the square noodles, but do make Grandma’s egg noodles and have them cut like you see in the store. Mix both together and pour over some brown butter. Yum!!! Never bacon or sugar, but we serve it with kolbassy fried up on the side. I guess you could cut up the kolbassy and throw it in with the cabbage. I just made this the other day for my German boyfriend. He loved it. He says his mom used to make something similar when he was a kid. P.S. My bf is German/Jew. The Jewish is from his mom’s side. Ahoj! Once again, halusky is one of those dished we had very often while growing up and I make it now and my 12 year old son goes wild for this. I make mine very similar. I grate my cabbage as you do, saute it in a pan with some oil and some butter as well as salt and pepper. Cook it low and slow to get rid of the water. You can squeeze the water out, my mother and I do. But when it starts to brown by itself, I add some brown sugar and then some cinnamon. It adds a sweetness and a bit of “something” that is incredible. You can also add a bit of nutmeg, but not too much! Then we use home made egg noodles (a very stiff dough and grated into small bits) or wide egg noodles bought from the store. You can use bow tie pasta or Kluski noodles but that is a personal preference. When the noodles are almost done brown some butter in a separate saute pan. Mix everything together, add salt and pepper to taste. It is to die for! One bite of halusky and I am transported back home to my childhood with my baba. And I’m in heaven! Are you Carpatho-Rusyn? I’ve never met anyone who is that outside of my family. We’re Slovak and Carpatho-Ruthenian or Carpatho-Rusyn. Same thing. Oh, I haven’t had kapustove fliacky in a while! Yummy! Delicious! I am going to do this tomorrow. My mom used to do this for me when I was little. It is going to be a perfect refueling meal after my tennis fitness kettlebell workouts. Yum, yum, thanks for posting. I love this meal! In our family we cut the cabbage in thicker strips. Also don’t use egg noodles, try bowtie pasta for a new twist. Its great! Kapustové fliačky sa robia na slano a na sladko. My máme radi fliačky na sladko. Kapustu nastrúham, osolím a po chvíli vytlačím vodu. Na oleji potom kapustu upražím do bledo hneda. Pridám máličko mletej škorice a štipku mletého korenia. Kapustu vysypem na fliačky a osladím mletým cukrom. Urobte si toto jedlo, budete ho milovať. Dobrú chuť. We just made this today…one of our favorites! Had it with some the sausage that we made last weekend. This is how I learned to make it when I lived in SK. I found this recipe can convert even the most hardened cabbage haters! Whether to add sugar is very controversial, in my experience Hungarian non-Jews don’t do it, while Hungarian Jews do. It’s important to slowly caramelize the cabbage and keep in mind that it will shrink in size a lot. 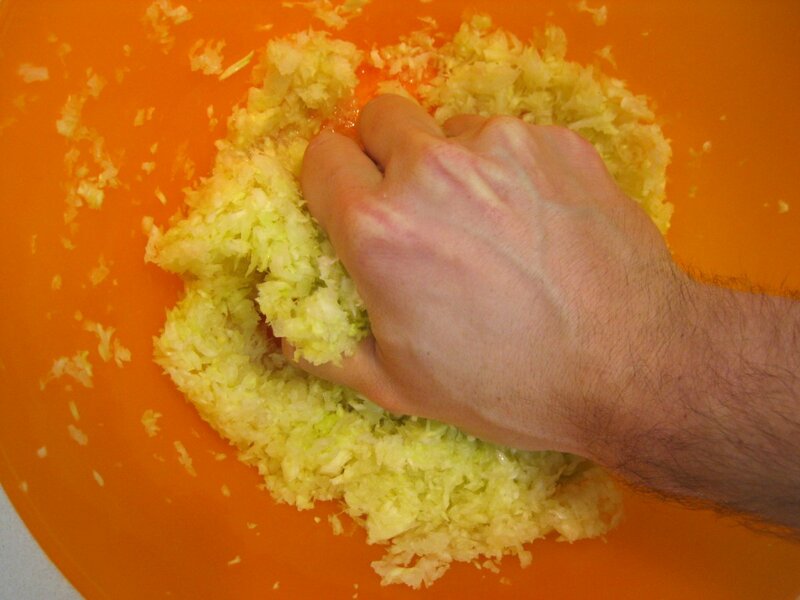 My home ec teacher always instructed sauerkraut every time we made it. Tastes just as good!! A lot of good heated, democratic discussion going on here. What IS the right way to make this dish? Once the Easter ham or any ham is almost gone we would grind up the left overs. 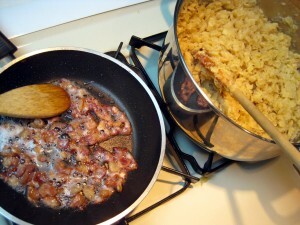 Then saute the ham with onions and add this instead of bacon to the dish. Tastes great. We love this dish and it has become a family favorite! Love the suggestion of caraway seed and also Kielbasi, yum! Only wish the noodle flakes were easier to find, and have my brother bring them to me from Cleveland. When our Mom prepared this in large quantities for family reunions there were no leftovers!! We sauté cabbage, onion, salt & pepper in lots of butter and combine with the noodle flakes. Hello Elaine. I don’t know where you live but where I do, on the NE coast, every stopandshop or shaws grocery market have shelf of jewish foods located within ethnic and international food aisles. 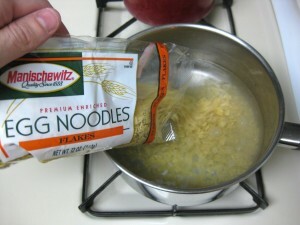 Somewhere among jars of gefilte fish I always find noodles fliacky. Although, the cut of pasta is smaller than I remember it was back home. my mothers parents are from Czechoslovakia, how ever she was born in the US. She always made this simply by cutting up the cabbage and frying it in butter then add elbow noodles and salted it. its a favorite of mine and I make it every once in a while. If I could choose only one thing to eat for the rest of my life, this would a it. And now, after years, I know what it is called in Slovak. Thank you! My Slovak grandma passed when I was 5. My American mother learned many of her recipes, but, has no idea if their Slovak name. I am SO happy to have found this website!